All Returns must be done within 30 days of the original date of purchase and must be accompanied with the original sales receipt. 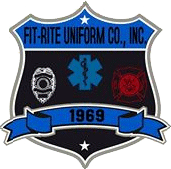 Fit-Rite Uniform Co. will refund or credit the value of the item and any taxes that were charged (except where an item is repaired and returned). Original shipping charges are nonrefundable unless the return is related to a Fit-Rite Uniform Co. error. All returns must be in new resalable condition, in original packaging with manufacturers labels attached. Any item worn, used,altered, out of the original packaging, or tags removed is not returnable. Special order items or items that have been altered, decorated, engraved, customized, or otherwise embellished at the request of a customer cannot be returned unless the return is related to a Fit-Rite Uniform Co. error. All clearance items are sold "as is" and cannot be returned. Gift certificates cannot be returned or redeemed for cash or credit except where required by law. A Returns Authorization number is required for ALL purchases made by government agency or business customers; contact a customer service representative. Returns for products that are Hazardous Materials or ORM-D (including but not limited to self-defense sprays, select first aid kits and components, cannot be accepted. If you are unsure if the product you are returning is a Hazardous Material or ORM-D, please contact Fit-Rite Uniform Co. Customer Service. Many products sold by Fit-Rite Uniform Co. have manufacturer's warranties. For returns relating to matters covered by a manufacturer's warranty, contact the manufacturer directly or Fit-Rite Uniform Co. to coordinate the repair or return of any such item. A shipping fee for a manufacturers warranty returns may be required.